Bhimashankar is a dream destination for any trekker, a perfect setting for an exciting and short eco-adventure. The adventure begins early morning with the first challenge to break the inertia of the RAT race RUT and get out of the bed on a fine Sunday of the last month of financial end. But it’s worth the effort for because after mid march till end of summer it’s going on challenging treks like Bhimashankar will be difficult because it’s going to get hotter by the day. We have tuned the trek considering it’s the financial yearend; we will booked a private vehicle that will drop us to the base village Khandas and pick us up at Bhimashankar when we reach on the top. We start early hours in Mumbai and target reaching Khandas at the earliest. We are ready for the trek once we finish our induction and introduction. The trail leading from Khandas village to Bhimashankar goes through all kinds of terrain; the trail start as a flat cross country walk to a semi-deciduous scrubland and as you progress the climber gets steeper and finally ending in a ever-green forest. Few patches also involves a bit of armature rock climbing. You pass through a glimpse of history as you cross two forts Tung and Paddar Killa; Once on top of Bhimashankar you can’t resist visiting Ancient Jyotir ling temple. We will not get chance to explore the mysterious Gupt (Secret) Bhimashankar Ling hidden the cool forest Bhimashankar. If we are lucky we may get to see the secretive Shekru (Giant Squirrel of Bhimashankar); for anxious bird watchers there is plenty of Bird life keep your binoculars; camera and field guide handy. 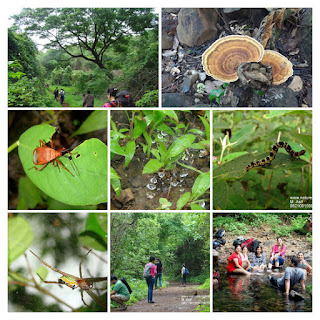 A walk through the old jungle of Bhimashankar is magical experience livening your spirit green and clean. Get cozy in pleasant Climate; put your feet up at end of the day in any vintage Ashrams; If in mood for sweet tooth try the local Khoya Sweets served by warm people; there is lots more to discover for those inquisitive and adventurous. But be ready to rough it out and sweat it out. We are targeting to hit Bhimashankar by 3 noon considering the warm climate; if we time it well we can even reach Bhimashankar by 1:30 – 2 noon and have more time on the top. 4:45 am We will start back for Mumbai. 10:00 pm Targeting to reach back in Mumbai. There are three route to Bhimashankar starting from Khandas; one is from Ganeshghat the easiest at the same time the longest; 2nd going via waterfall and the third the shortest but the most adventurous (sidi ghat) route; we will be taking thist shortest but also the most adventurous trail to Bhimashankar. The trek to Bhimashankar via Sidi Ghat is adventurous and involves a bit of elementary rock climbing. We will be carrying safety equipment like Carnamental Rope (Mountaineering Ropes); Carabineers; Descender; Mechanical Ascender; Tape Slings etc. The group will be a mix of experienced trekkers and also new explorers into trekking (but ready to rough it out in the psychological thriller walk). Contribution Rs,850/= for members and Rs.950/- for non-members. Only includes transport; technical gear; guide charges and evening tea/shacks. You have to carry your own lunch; breakfast and water. For registration Prepare name of “Nature Knights – ICICI Bank A/c. No: 0412050000217” and deposit the same in any ICICI Bank ATM. Do a electronic transfer to our account (Add Rs.25/- for electronic transfer). No refund after March 5, 2008. Only 20 seats available kindly reserve your seats well in advance. Kindly carry your packed breakfast and lunch to be independent so that we do not waste time in restaurants and Dhabas on the way. We will only stop to freshen up somewhere on the way. Also carry some chocolates; biscuits; salad items; 3 LITERS WATER PER HEAD for on-the-way in-between meals and water. Do not carry anything that will get spoilt. Capacity of bag should be 30 to 40 liters. Detol soap (small), Hand Sanitizer, Comb & Small Hand mirror, tissue wipes, sun screen etc. Carry Personal medical kit and personal toiletries in a separate pouch. 3) Towel (light) and carry one cloth, useful for wiping dirt. 10) Carry a note pad and two ball pens for your diary writing.